Baby Sponge suitable for all infants from birth, added green tea to purify the skin and added Chamomile to Calm and Soote the skin. So there is a sponge here for everyone. 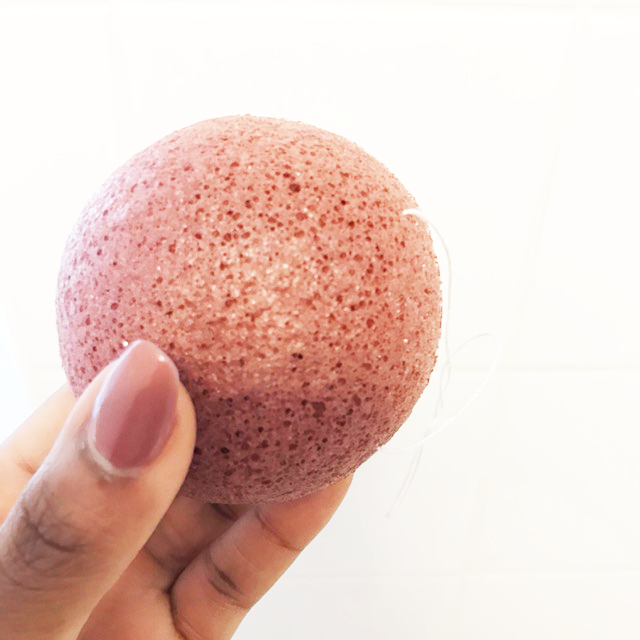 In this particular review I'm going to focus on the sponge I received and my thoughts on this one but before I give you my thoughts I would like to explain a bit about Konjac Sponge. What is a Konjac sponge? 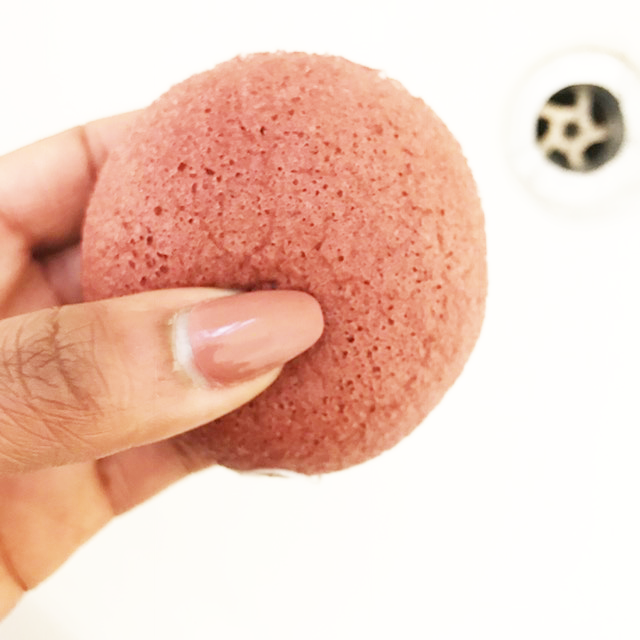 The Konjac Sponge is a beauty tool made out of a pure vegetable fibre that cleanses, revitalises and exfoliates the skin. The sponge is made from the Amorphophallus Konjac plant root, a plant used as a healthy food source for its medicinal properties in many parts of Asia.This naturally moisture and fibre rich plant is loaded with goodness,the list of nutrients are too much to mention and include Vitamin, A,E,D,B1,B2,B6,B12, Magnesium, Iron and Zinc. Being naturally Alkaline the konjac also helps to balance the skin's PH. The japanese has recognised the benefits of the Konjac plant since the 6th century. 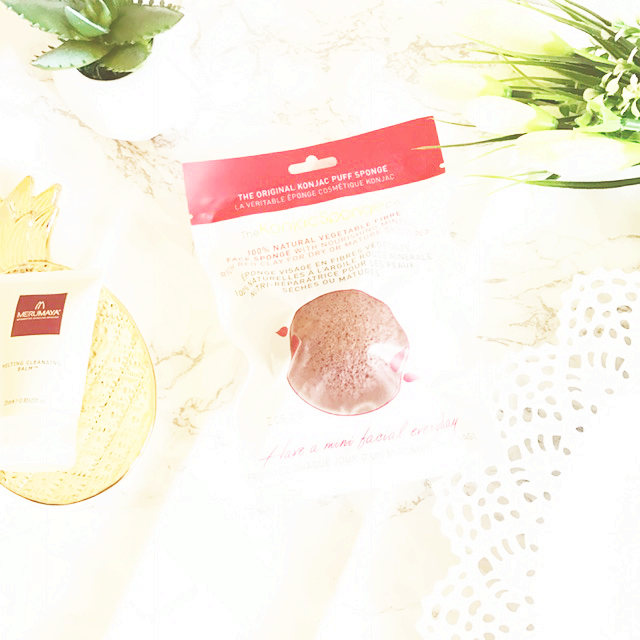 How to use the Konjac sponge? Massage the skin in small circular moments with the damp sponge ( cleanser at this point is optional). Concentrate on problem areas and large pores. Rinse the sponge thoroughly after use and gently squeeze out excess water. The sponge will not overstrip the skin, so no dry, tight feeling afterward. Skin starts to take a smoother more airbrushed appearance after a few weeks. At first when I received the sponge I thought it needed a cleanser so I was planning to either use my Nivea 2 in one cleanser or toner or a new cleanser I received which is the Meryuma Cleanser Balm but I wanted to see how it worked on its own since the instructions did say there's no need for a cleanser. So I used this sponge for a week to do the review but I will continue to use it over the next few weeks so I will post an update also either on my Twitter or Instagram,. So I followed all the instructions as mentioned in terms of the use of the sponge. After unwrapping the sponge it was noticeably very hard, after running it under water it quickly became soft. I started to rub the sponge over my face under my eyes,nose, tzone ect I left no stone unturned. While rubbing my face I found this sponge to be very gentle so I was slightly concerned right away as to whether I would see results, since it mentioned that it exfoliates the skin I was expecting a little roughness or grit to it. After using the sponge my face felt really soft but it was the next day that I noticed my skin looking a bit more vibrant. Fast forward to day 3 I started noticing the tone of my skin begin to even out and I even tried the sponge with a cleanser the rest of the days and I've got to say the cleanser you use makes a difference. I will be doing a separate review on the cleansers but when I used the sponge with one cleanser I couldn't stop touching my face and when I used the sponge with a different cleanser the results were good but not as effective as the first one. The instructions on the sponge says give it 3 weeks to see results,since I've been using this sponge I've felt so much more comfortable leaving the house without foundation because the last few weeks I've been so busy with life that my skincare took a back seat so my skin was looking dull, uneven, blotchy and black head proned. I've got to say I'm a person that hates feeling like I need to wear foundation I like having healthy looking skin without it but these last few weeks prior to using the sponge I couldn't leave without some sort of concealer or foundation. This is a beauty tool that I never knew I needed the fact that you don't need a cleanser makes it easier for those nights when I've come in late and I cant be bothered to exfoliate, cleanse, tone ect I just wet the sponge give my face a good cleanse and off to bed. I just want one for my little girl and a few more for myself because the Japanese are certainly on to something with this sponge. After using the sponge I placed it on the radiator,the next day it looked smaller than what it looked like when I first received it so I thought woops!.But when I ran it under water it expanded again to its actual size(just so you would know what to expect).But apart from that its quite easy to keep in good condition. Thankyou Konjac Sponge Co for sending me this sponge if I knew it was going to work so well on my skin I would have done before and after photo's(Darn it! ).So I guess your just going to have to take my word for it and get the sponge! The retail price for the facial sponges is £8.99. They can be bought directly from their wesite Here! or places like Selfridges, Harvey Nichols, Liberty, House of Fraser. All of their stocklist can be found Here! I like konjac sponges to remove wash-off masks but haven't used any "flavored" konjacs. I should give them a ty! I definitely recommend this one it's such a handy beauty product for skincare. I have something similar to this and I love it, but I've never tried this brand! This is the only brand for konjac sponge I've tried so far and I love it can't believe I didn't know about it sooner! Thank Rachel and yes of course it's encouraged me to try other products that I overlook. I received one of these in a subscription box a couple of months ago and still haven't used it as I didn't think much to it and didn't really know how to use it or why I really needed it. After reading this post I can't believe I haven't tried it yet! It sounds so so good I cannot wait to give it a go. Great post lovely! This sounds really good! I use a sponge with a cleanser to clean my face but this sounds perfect like you say for those late nights will definitely be checking this out. So awesome that you've had noticeable results using this! I've been wanting to try a konjac sponge for so long but I already have so many exfoliating products that I didn't want to over do it. I really do need to go out and grab one though! Yes go for it you wont regret it! Me tooo a definite staple now! Sounds amazing. I've been using my beloved Fore Luna mini, but maybe I'll give this sponge a try. Thank you. Yes definitely give it a go would love to know your thoughts on it when you try it! I've heard good things about this konjac sünger product. Going on my wish list now! Welcome to my blog TaslynMatina.